The Sustainable Symphony seeks to become the premiere alternative in orchestral programming by offering highly-trained collaborative pianists as orchestral substitutes in performance and serves as a solution to help reverse the downsizing of classical music in America while increasing new job opportunities for musicians. By identifying both new and existing venues for this initiative, those organizations disenfranchised from works with orchestras can have a high-profile alternative within their reach. Additionally, through its Sustainable Symphony Hallmark Series, this project will reestablish the option of small concert settings as excellent venues to host great masterworks, making these works much more widely available in live performance. Other benefits include a renewed viability of the treasury of symphonies, oratorios, concerti, and operatic repertoire; more jobs for collaborative pianists, instrumentalists, and vocalists as well as increased community engagement. Currently, the Hallmark Series showcases the Sustainable Symphony’s benefits and appeal through two concerts: Requiem of Solace: Brahms' Human Requiem and Defiant Requiem: Verdi at Terezín. Together, these masterworks may be presented in a single season, or be scheduled based on the needs of the community or hosting venue. These events promise to achieve significant community involvement, increased project awareness, and sizable audience turnouts. As the reputation and reach of the Sustainable Symphony grows in size and scope, more benchmark masterworks will be added to the Hallmark Series. 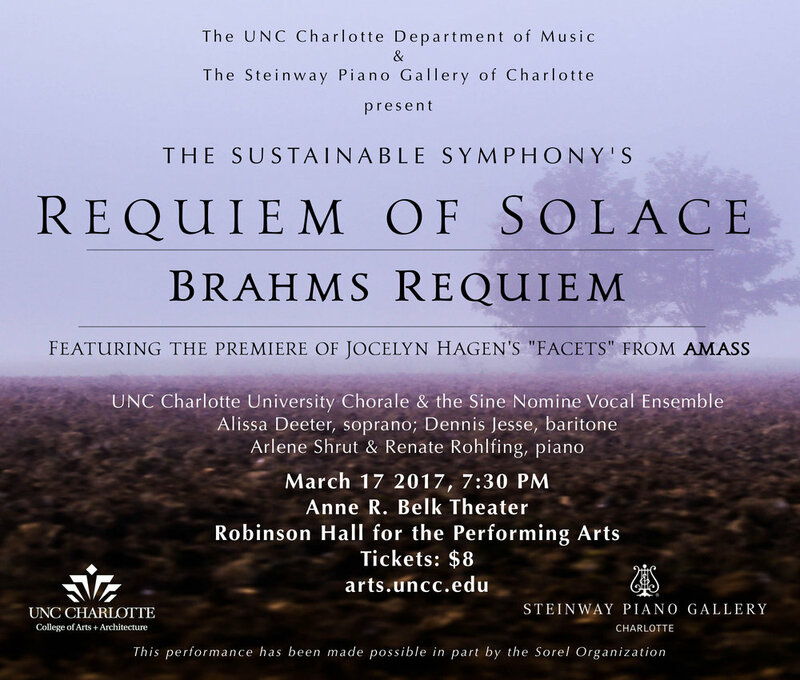 The South Carolina premiere of Requiem of Solace: brahms' human requiem, with support in part by the Sorel Organization, will be on April 16, 2018 on Converse College’s CarLOS Moseley Series and Defiant Requiem: Verdi at Terezín is planned for January 2019. After the events of 9.11.01, Brahms’ Ein Deutsches Requiem was often the musical masterwork substituted in the place of previously scheduled entertainments in locations all over the United States. Americans felt drawn to join together and mourn those who died in the terror attacks in New York, Washington D.C., and Pennsylvania. Then and now, among large works of classical music, Ein Deutsches Requiem singularly possesses both a collective message and ecumenical approach that brings consolation during times of great loss. In the current polarization of ideological extremes and the unleashing of global uncertainty, opportunities must be created to gather together in unity of purpose to ponder the unique universality of the wonders of life and the inevitability of death. Requiem of Solace: Brahms' Human Requiem captures a particular essence of intimacy and healing through the use of two pianists in duet versus the grandeur of orchestra. Alissa Deeter has written a new translation for the requiem, an elegant and poetic English interpretation in a contemporary and living voice. The masterwork will be preceded by a new companion piece, a commissioned work by Jocelyn Hagen, whose message is of hope, strength and inclusion. The companion piece entitled “Facets” is a revised version of amass, specially redesigned for one piano and chorus and retitled for the Brahms Requiem: Requiem of Solace. It includes soprano and baritone soloists as in the Brahms as well as two additional choral movements. Defiant Requiem: Verdi at Terezín is a concert-drama conceived and created by the Defiant Foundation’s Founder and President, Maestro Murry Sidlin, combining Verdi’s Requiem, video testimony from survivors of the original Terezín chorus, and footage from the 1944 Nazi propaganda film about Theresienstadt. The performance also includes actors speaking the words of imprisoned conductor Rafael Schächter as well as others. This concert-drama honors the memory of Schächter, his choir, and the performances of Verdi’s Requiem at Terezín as well as celebrating their moral courage and the transcendent power of the arts and humanities. Resonating throughout is the universal message that the human spirit can be elevated in the most oppressive conditions and that hope and resilience are resolute. Conductor Murry Sidlin and pianist Arlene Shrut will be joined by high-profile soloists and a select choral ensemble. In addition to the performance of the Defiant Requiem: Verdi at Terezín, ancillary events may be scheduled including a screening of the documentary film Defiant Requiem with a question and answer segment led by Murry Sidlin. Mass Appeal, 1943, a short theatrical work with music written by Maestro Sidlin, creatively recounts the dramatic scene between prisoner conductor Rafael Schächter and the Council of Jewish Elders in Theresienstadt regarding the conductor’s intention to prepare and perform Verdi’s Requiem.